Singer-songwriter and actress Megan Nicole's latest project is all about empowering young people. In this exclusive interview with J-14, she opens up about her collaboration with DC Super Hero Girls. The animated franchise focuses on the DC Super Heroes and Super-Villains you know and love — only as teenagers — and Megan has been working with them since the launch of her version of "Get Your Cape On." In this Q&A, the starlet dishes on everything from the most important advice she's ever been given to the importance of embracing your true, authentic self. J-14: Can you tell us a little bit about your collaboration with DC Super Hero Girls and why it's important to you? What do you want fans to take away from the campaign? Megan Nicole: It's been so incredible to team up with the DC Super Hero Girls and help spread their message which is all about empowering young people. I recorded my own version of their theme song "Get Your Cape On" and made a music video for it as well, which was so fun! It's important to be able to encourage fans to discover their inner superhero and I hope they know the importance of embracing who you are. I think something I was reminded of during this project was that even superheroes fall sometimes, but get back up again. It's okay to fail, it's okay to have an embarrassing moment, it's okay to be silly. That doesn't make you any less super. J-14: Do you have a personal connection to the DC universe or any of the female Super Heroes or Super-Villains? Megan: A lot of my fans know Batman has been one of my favorite superheroes growing up. I've also connected with Wonder Woman as well! It's been surreal in some ways to be working with a universe that has inspired so many people already and I'm honored to wear that cape. 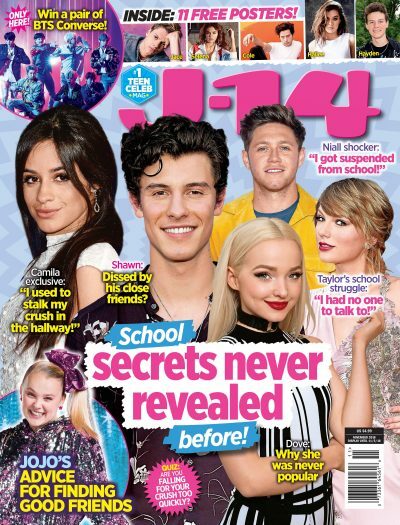 J-14: Why is it important for you to empower young people to be confident and embrace their inner strength? Megan: It's one of the most important things we can do. I'm an adult and I have those moments where I forget to embrace the things that make me who I am. Embracing those things is what gives you the confidence you need to go out and chase after your dreams. I want to see more and more young people doing just that and working together to make this world better. J-14: What's the most inspiring message that someone has ever given you? Megan: My parents always taught me to never put limitations on my dreams and to work hard to achieve those goals. J-14: For the holiday season, you participated in the Get Your Cape On! Team Up To Give Back campaign. Why do you think it's important for young people to give back to their community? What's a cause that's near and dear to your heart? Megan: I think it's important to give back to our communities because if we want to see a better world it starts with us at home. There is an organization called "A Place Called Home" that is doing some amazing things in the LA area. They have changed so many young people’s lives and given them a space to learn about themselves and to grow.